We believe in a future where the Internet of Things and total automation win. But that doesn’t mean SkyNet. Home appliances have already learned how to save time and resources, allowing you to focus on things that are more important than turning on the water heater. Unfortunately, the last example can’t be done remotely. Unless, of course, you have Ajax WallSwitch at your side. WallSwitch is a 38-by-25-millimeter box that can be placed in a wall outlet. Inside there is a relay that works at least 200 thousand inclusions. At the right moment, it closes or opens remotely using a mobile application, activating or stopping the current supply, respectively. The mobile application allows you to check the network current and voltage, as well as monitor the kilowatt usage of devices connected to WallSwitch. It works in 220V and 110V networks, but power to connected devices may differ. You can check the exact numbers in the tech specs of the WallSwitch. We’ve included protection against over-current, voltage surges and overheating, so that the device can react quickly to unstable power. If the voltage is too high or low, the relay opens. And as soon as the voltage returns to normal, the relay automatically closes. It handles overheating the same way. WallSwitch only works as part of the Ajax signaling. In future we make plans to add scenarios that automate the response of WallSwitch in response to the events recorded by the system. In the meantime, let’s focus on the methods of using the switch. If you install WallSwitch together with an electrical contactor in the shield, you can use it to completely de-energize your home. It’s especially convenient for a summer residence or a country house: a few clicks in the appendix, and on arrival, your refrigerator is running at the perfect temperature and you have hot water flowing from the tap. WallSwitch can also create the illusion that you’ve never left. When you are on vacation or a business trip, you can turn on the lights remotely. This can be enough to scare off would-be intruders. WallSwitch helps lower your energy costs. This is especially the case in a home with a water heater, electric boiler, heated floors or air conditioner that doesn’t have a sleep mode function. You activate devices remotely, just a few hours before returning home. And you can keep them on standby at all other times. You can also use WallSwitch to avoid flooding your neighbors’ properties in the event of a burst pipe. You’ll need to get a water electrovalve that overrides water control in your bathroom or entire apartment. It should be placed in the socket with the installed switch. To determine a leakage, you can use Ajax LeaksProtect. The detector will instantly send a notification to the mobile app, and you will be able to turn off the water with just a few taps on your phone. If you install electronic locks, you’ll be able to let guests into the house and finally stop using keys. In the future, you’ll be able to lock doors automatically using the security system. A conventional drive unit will help open and close blinds with one touch of your finger. This will give the impression that someone is always at home. There’s no need to spend extra time getting in and out of your car. Some devices, such as a TV cable box or switchboard, require periodic preventative rebooting. With WallSwitch, you can do this without even getting off the couch. In any event, we suggest discussing your specific goals for the system with the technician during installation. 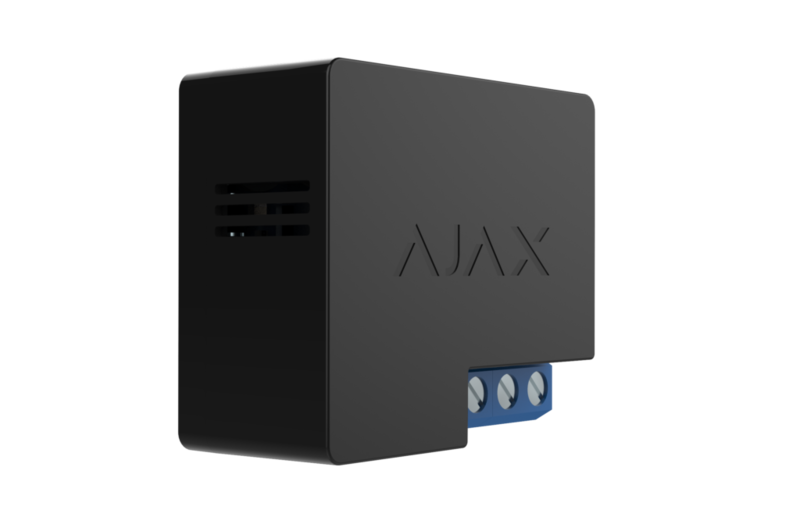 They can help create the ideal Ajax experience with your remote-controlled devices. Do you have any other ideas on how to use Ajax WallSwitch? Share them in the comments and we’ll add the most interesting ones to this post.